This Motorola Mbp15 digital monitor comes with a temperature monitor to ensure optimum conditions. 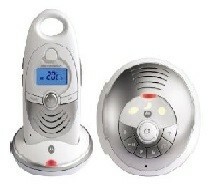 This baby monitor has a 2-way communication capability with a range of 300m and offers crystal clear sound with level indicator. The Mbp15 also provides 5 lullabies and a starry night light. An additional benefit to this digital monitor is a belt clip on the parents unit with a rechargeable battery for up to 5 hours wireless monitoring.